I would love to get my hands on this poster. I think this even may be better than Toei's Japanese poster. 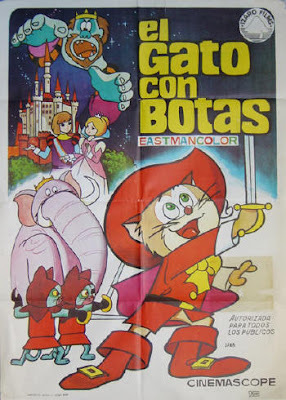 Here is Spain's contribution to our poster series. Tragically, I lost my DVD on my December flight into Bogota, Colombia, and I've been without a copy of Puss in Boots of Animal Treasure Island ever since. Augh! These are two of my all-time favorite animation movies. Obviously, every Miyazaki fan has bought their copy....right? It would help if Discotek would send more copies to retailers. And it would really help if Toei would finally give their classic animated features the proper respect they deserve. When the heck are we getting these movies on Blu-Ray? A single-layer disc from the year 2000 just doesn't cut it, guys. We wish it would happen, in the meanwhile, it's up to guys like me to try to keep the spark going. Speaking of which, I got a few goodies to share with you! Unfortunately only French subtitles, no English. Accidentally finding this in Annecy was one of the festival's highlights for me.